Constructor. The dimension of the ambient configuration space as well as the dimension of the function's output need to be specified (the co-dimension of the constraint manifold). I.E., for a sphere constraint function in. Compute the constraint function at state. Result is returned in out, which should be allocated to size coDim. Compute the constraint function at x. Result is returned in out, which should be allocated to size coDim. Compute the Jacobian of the constraint function at state. Result is returned in out, which should be allocated to size coDim by ambientDim. Default implementation performs the differentiation numerically with a seven-point central difference stencil. It is best to provide an analytic formulation. Compute the Jacobian of the constraint function at x. Result is returned in out, which should be allocated to size coDim by ambientDim. Default implementation performs the differentiation numerically with a seven-point central difference stencil. It is best to provide an analytic formulation. Project a state state given the constraints. If a valid projection cannot be found, this method will return false. Even if this method fails, state will be modified. Project a state x given the constraints. If a valid projection cannot be found, this method will return false. Returns the distance of state to the constraint manifold. Returns the distance of x to the constraint manifold. Check whether a state state satisfies the constraints. Check whether a state x satisfies the constraints. Returns the dimension of the ambient space. Returns the dimension of the manifold. Sets the underlying manifold dimension. Returns the tolerance of the projection routine. Returns the maximum number of allowed iterations in the projection routine. Sets the maximum number of iterations in the projection routine. Tolerance for Newton method used in projection onto manifold. Maximum number of iterations for Newton method used in projection onto manifold. Definition of a differentiable holonomic constraint on a configuration space. 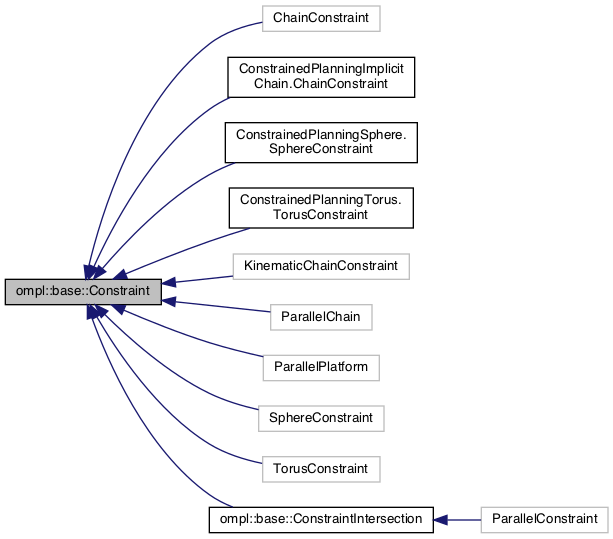 See Constrained Planning for more details. Definition at line 75 of file Constraint.h.